Posted March 7th, 2018 by Fascinating Rhythm & filed under News, Workshops, Workshops & public events. 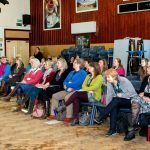 2018 Workshop was the best yet!…. 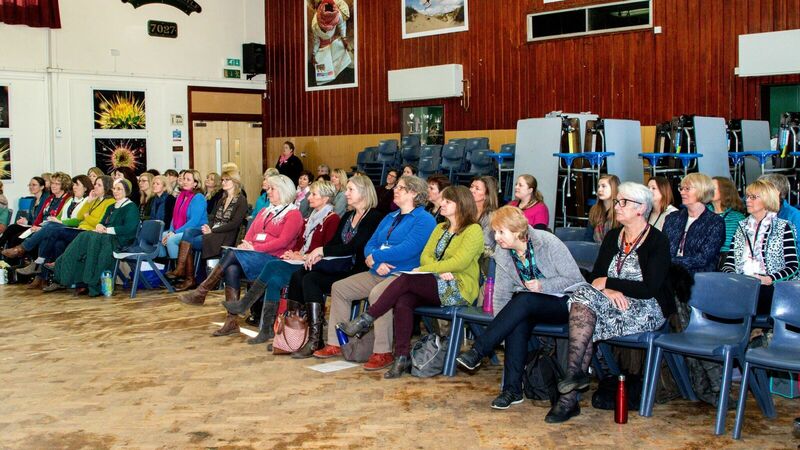 On Saturday 24th February we were excited to welcome 50 delegates to this years workshop. 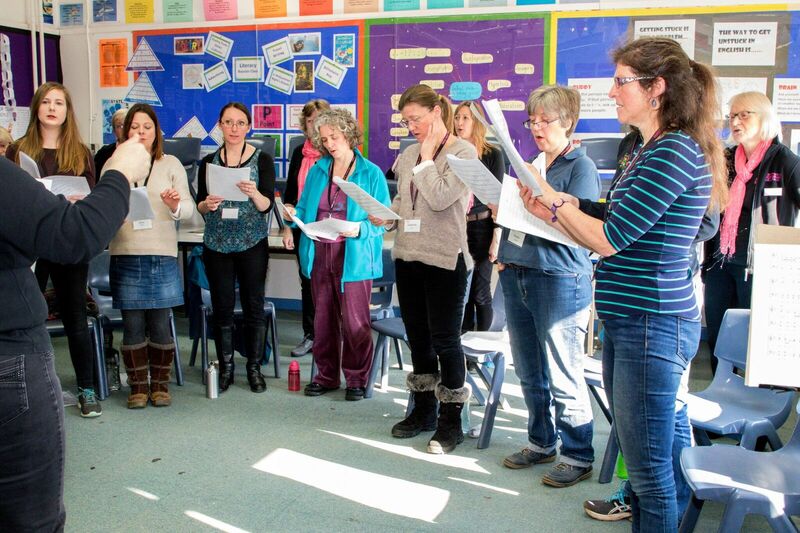 We were able to showcase a few of our songs, and after the delegates were given a vocal warm up they were split into their voice part for the day. 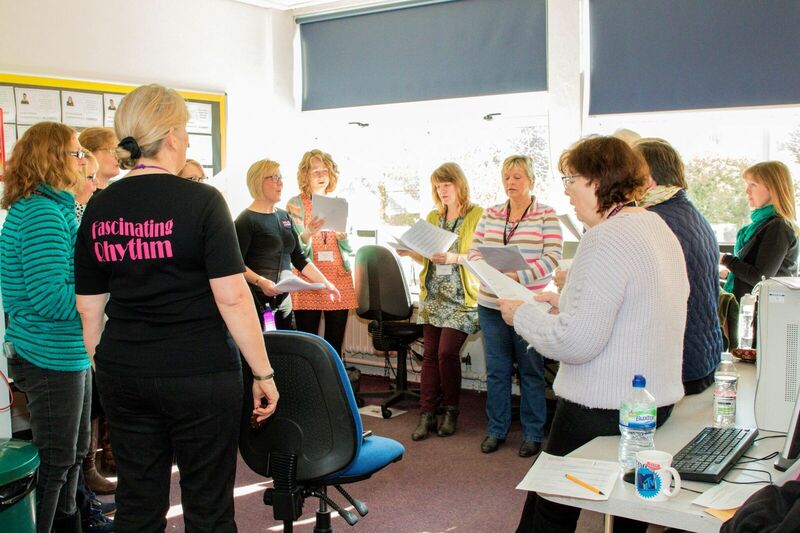 Fascinating Rhythm members then sang the song to them that they were going to learn from page to stage….. and they were delighted to hear ‘Shine’ by Take That, which actually is a 5 part harmony song. Hard work by every single delegate and we were absolutely amazed that they took on board section work and came together before lunch for a first sing through, which was incredible. During lunch (and much eating of cake) we were able to chat to our visitors and tell them about our hobby. 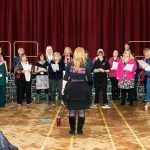 We were really pleased to hear that a few of our visitors intend to come to a normal rehearsal to see us again with an interest in joining us….. and we look forward to welcoming you all.. 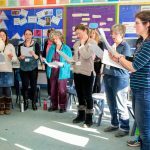 Fascinating Rhythm had a fabulous day with you all, thank you for joining us, you all certainly did ‘Shine’ and we hope to see you again next year if not sooner! Posted July 12th, 2016 by Fascinating Rhythm & filed under Workshops & public events. 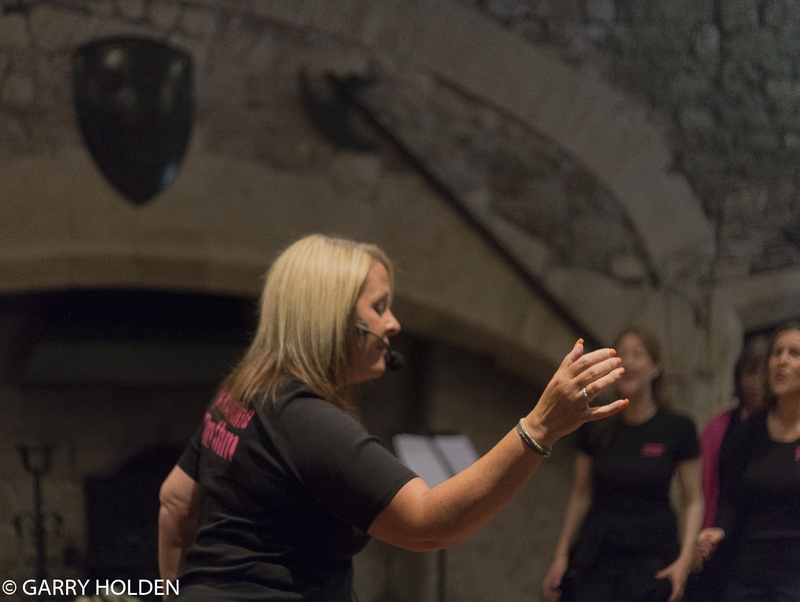 Thursday, 30th June and, thanks to some great teamwork, we were all risered up to take our rehearsal to the very impressive Tudor Room in Thornbury Castle as part of the Fringe Festival. 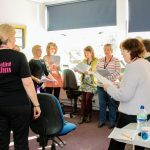 It was a ‘warts and all’ production in front of two separate and very appreciative audiences who had booked seats as we took them through the journey of tweaking, polishing and blending 4-part a cappella singing under the direction of Jo Dean, who also kept up a running commentary throughout. During both sessions, members of the audience were invited to join the Chorus to have a go – and both times the brave participants were just brilliant. 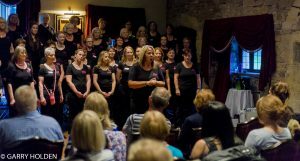 “You will shortly receive a formal thank you from Ian Walker on behalf of the Friends of Thornbury Carnival Committee for the great performance you organised on Thurs 30 June, as part of Thornbury Carnival Fringe week. However, I just wanted to add my personal thanks for your willing support for this community event and your suggestion to bring your rehearsal to Thornbury. 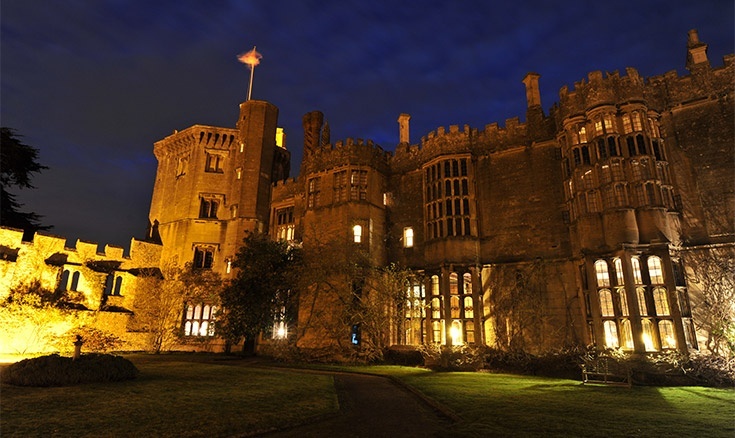 As anticipated, Thornbury Castle proved to be an ideal setting and we were very appreciative of you taking the trouble to join us, with the logistics of travel and the physical set-up required. 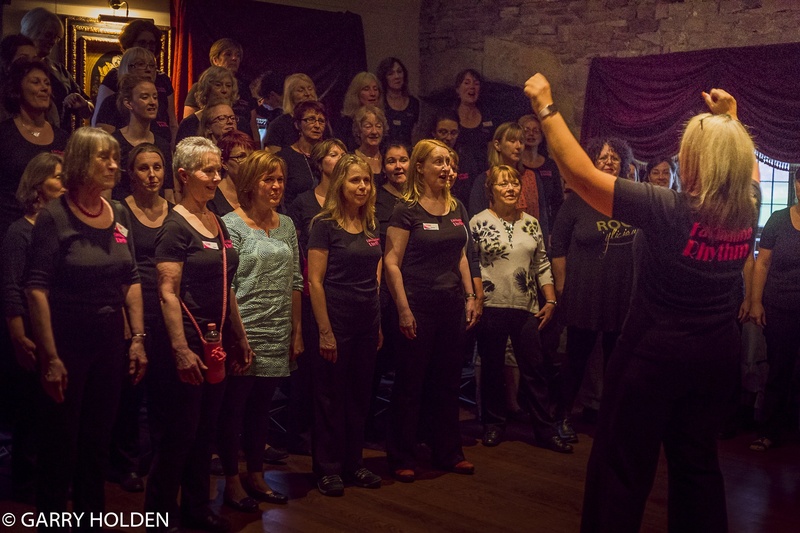 The choir sounded tremendous, as witnessed by the great reception from our two audiences. Posted May 8th, 2016 by Fascinating Rhythm & filed under Workshops & public events. The drive to get to the beautiful BeauDesert School in Minchinhampton, Gloucestershire on Saturday, 7th May was a treat in itself, though we did get a little concerned about the amount of traffic trying to get away from the last day of Badminton Horse Trials. Nearly started on the dot of 7:30pm, just waited for late arriving audience who got caught up in the equine exodus. 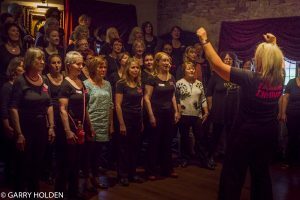 We had to skimp on risers, so singing sardines with the barest of choreography was the order of the day but we had a really great time with a lovely responsive audience and no serious injuries, entertaining with two 40 minute sessions, supported by our in-house septet RhythmMix. 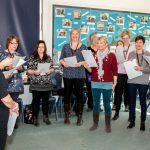 Our MD, Jo Dean, is the Scheme Manager for HomeStart Sedgemoor and knows from first hand experience what a difference this charity makes to families in need so we dedicated one song in particular – ‘Fix You’* – to their group of volunteers; its very emotive words touched many of the audience and FR learned yet again how difficult it is to sing well with a wobbly bottom lip. *Covered by ColdPlay and arranged for us by Pete Nugent (www.noojtracks.co.uk). Great Show with the GWC! Posted December 20th, 2015 by Fascinating Rhythm & filed under Workshops & public events. 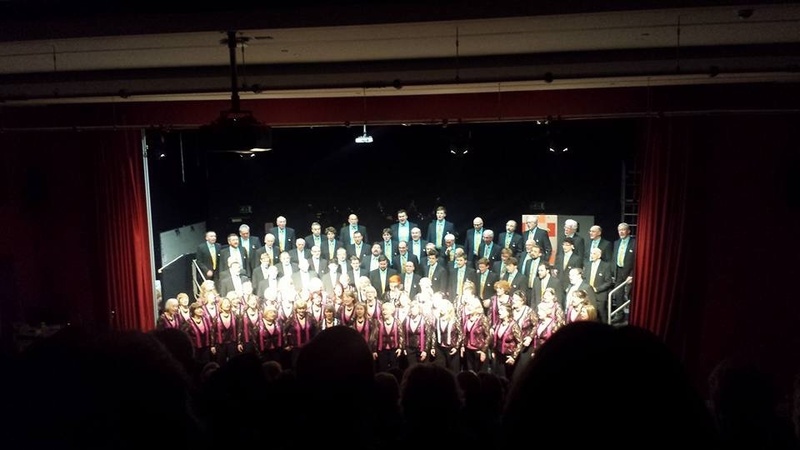 What a lovely way to start off Christmas week – our joint show with the A-Maz-Ing and hugely entertaining Great Western Chorus on Saturday, 19th December. 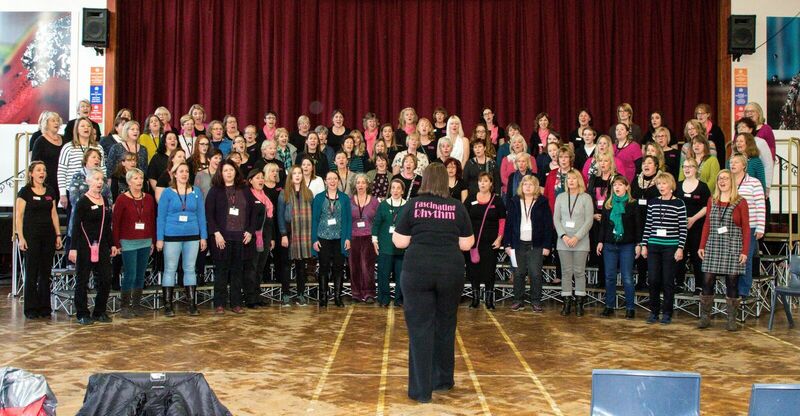 Both choruses came together for the opening and closing numbers – over 90 mixed voices giving it wellie – to a full house of a really appreciative audience. 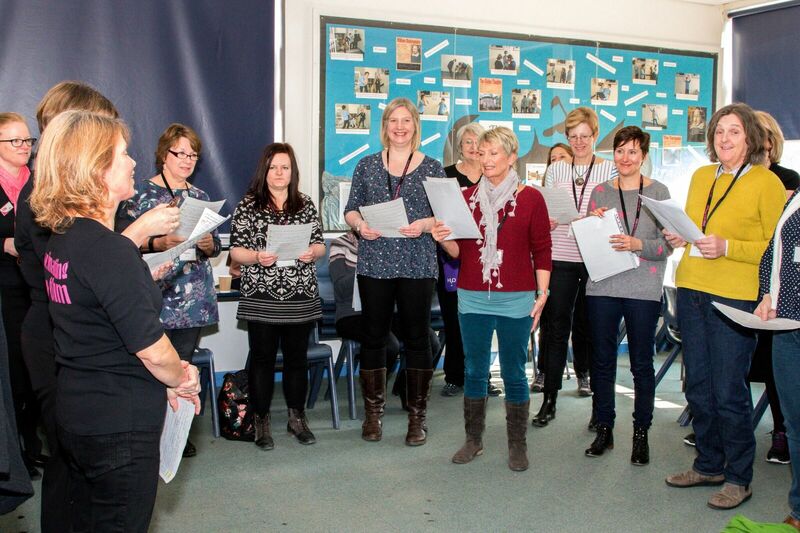 GWC’s in-house group H Club and FR’s RhythmMix added something a little different to the programme; mince pies in the interval, lots of tinsel and sparkle in the second half and a special guest … Elvis Presley singing ‘Blue Christmas’! Worth missing the Strictly Finals for. FR Sing in Men’s Underwear! Posted December 7th, 2015 by Fascinating Rhythm & filed under Workshops & public events. 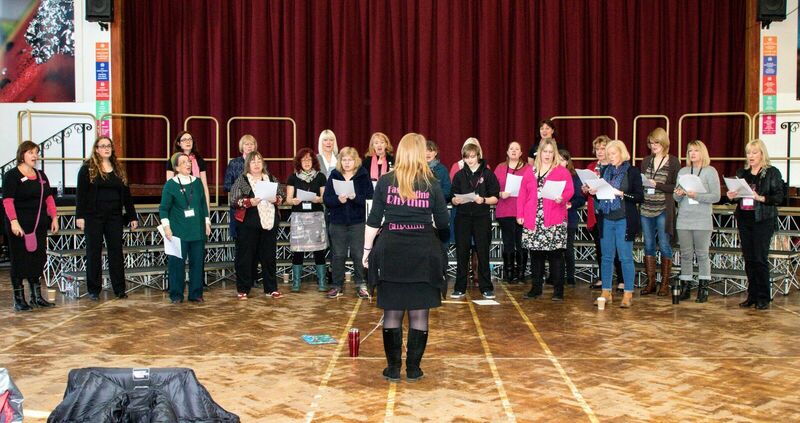 Saturday 5th December saw us return again to M & S, Cribbs Causeway for some festive season singing. Last year we had a space in Ladies Lingerie – this year we were in very close proximity to Gents boxers! Right by the entrance onto the Mall, our carols were embellished by a very nicely toned security alarm sounding at intervals, and further enhanced by the tooting of the Mall’s ‘weary shopper’ train doing it’s circuit (see the MD’s frozen smile). Very complimentary and generous shoppers filled our bucket which raised over £100 for M & S’s Breast Cancer and our own Home Start Stroud charities. We were exceptionally well looked after by the store’s staff – and tickled pink to be asked back for next year. Wonder which department ….